After a quiet patch we have a number of Art of Psychiatry meetings planned and details of these will follow shortly. 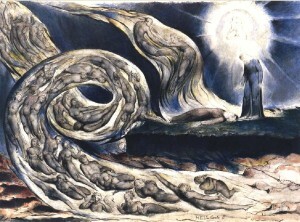 William Blake (1757-1827) is a seminal figure in the history of the poetry and visual arts. Blake claimed that he has seen an angel in a tree at Peckham Rye, leading to speculation that his imagination is more vivid than reality and some of his contemporaries doubted his sanity. Viewing his works can provide insight into mental states that may be otherwise elusive to psychiatrists. In this talk entitled “Blake as prophet”, Prof David Bindman will explore the intentions behind Blake’s prophetic works, and his apocalyptic ambitions. It will focus particularly on Jerusalem and its illustrations, and talk about the short poem of the same name, that was not part of the larger work. David Bindman is Emeritus Professor of the History of Art at University College London. He was educated at Oxford, Harvard and the Courtauld Institute. Professor Bindman has taught and lectured extensively, and has held fellowships at international institutes, such as the Getty Institute and the Du Bois Institute at Harvard. He is a noted scholar on Blake, writing the introductory text to William Blake: The Complete Illuminated Books. His recent interest has turned to the representation of non-Europeans in Western art, culminating in the book Ape to Apollo: Aesthetics and the Idea of Race in the Eighteenth Century. All are welcome (general public, medical and non-medical). Wine and snacks provided.